This guide will help you to change the default login page provided by the Spring Boot Security. To do that, you need to override the configure(HttpSecurity http) method of WebSecurityConfigurerAdapter class. The above configuration ensures that every request requires the user to be authenticated. Override configure(HttpSecurity http) method which instruct Spring Security to use your login page. Find the list of all tools/technologies used in this application. Add the following dependencies in your pom.xml. Final project structure of our application in STS ide will look like as follows. 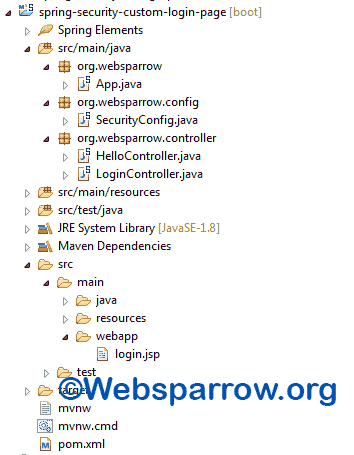 Create a login.jsp file inside webapp directory which replaces the Spring’s default login page. Note: Field name for the user name and password must be “username” and “password” respectively. Create a LoginController class which contains a view controller for /login. Create a SecurityConfig class which extends the WebSecurityConfigurerAdapter class and override its configure(HttpSecurity http) method. Now your custom login form has been set. It’s time to check whether Spring uses your login form instead of the default. Run your application and access any URL of your application, it will redirect to your custom login form.